A newspaper article published by The Central Florida Press on June 20, 1930. The article reports news in Slavia, an unincorporated community southwest of Oviedo, Florida. 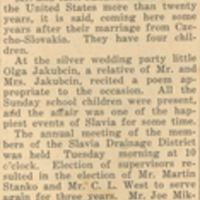 News topics include the silver wedding anniversary of Andrew Jakubcin and Barbara Jakubcin; the annual meeting of the Slavia Drainage District, the return of Andrew Duda, John Duda, and Joe Mikler from Chicago; and the shipment of vegetables, especially celery, from Slavia. Original newspaper article: "Slavia News." The Central Florida Press, Vol. 1, No. 9, June 20, 1930, page 3: Oviedo Historical Society, Oviedo, Florida. Digital reproduction of original newspaper article: "Slavia News." The Central Florida Press, Vol. 1, No. 9, June 20, 1930, page 3. “Slavia News.” RICHES of Central Florida accessed April 24, 2019, https://richesmi.cah.ucf.edu/omeka/items/show/5698.